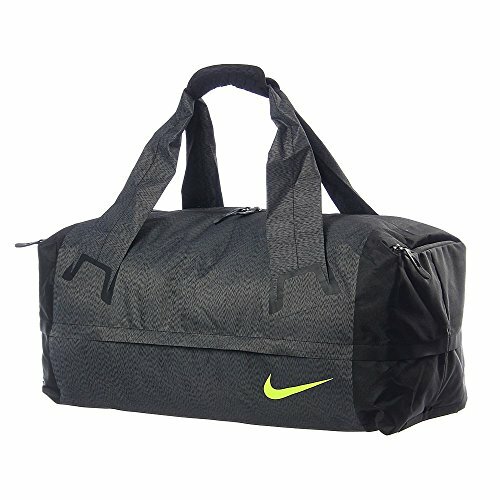 Nike Engineered Ultimatum Training Duffel Bag BA5220-010 by NIKE at Average Adventures. MPN: BA5220-010. Hurry! Limited time offer. Offer valid only while supplies last. DURABLE. VERSATILE. COMFORTABLE. The Nike Ultimatum Training Duffel Bag's unique construction helps it stand out-and helps it stand up to daily use. DURABLE. VERSATILE. COMFORTABLE. The Nike Ultimatum Training Duffel Bag's unique construction helps it stand out-and helps it stand up to daily use. LIGHTWEIGHT DURABILITY Designed for regular, long-term use, the bag's eye-catching tri-woven fabric offers a lightweight feel and heavy-duty function. VERSATILE STORAGE A foil-lined beverage pocket, plush-lined tablet pocket and discreet mobile phone pocket at the handle give you all-day utility. COMFORTABLE CARRYING Extra-long handles let you carry the duffel over your shoulder while a flexible handle wrap makes hand-carrying incredibly comfortable. Materials: Body: 100% polyester. Lining: 79% nylon/11% polyester/10% EVA. Dimensions: 66cm L x 25.5cm W x 28cm H approx.